In many ways, drone footage has revolutionized beauty. It's a whole new world when viewed from the skies. Humpback whale footage is no different. 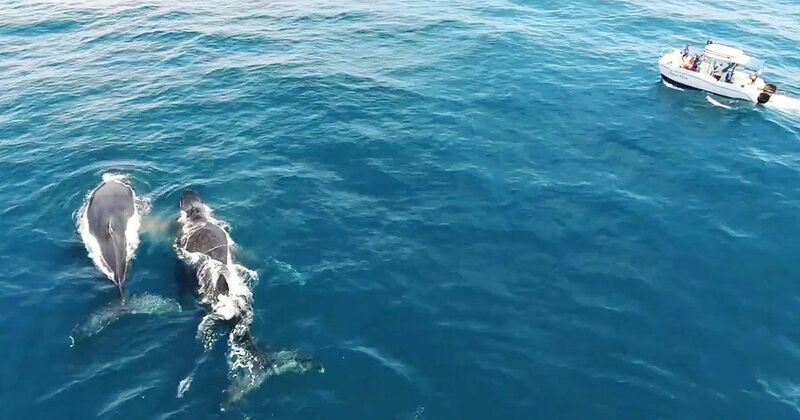 Today, even amateur filmmakers can attach a GoPro to a drone and capture amazing whale footage from above. The kinds of footage that used to cost thousands of dollar to produce can now be made with only a few hundred-dollar investment. This is an amazing example of whales captured by a drone camera. Three majestic whales swim through the clear blue water off the coast of Brazil. These mammoths can swim 16 mph and are known to migrate up to 16,000 miles each year. Videos taken from people lucky enough to be on nearby boats used to be the only way photographers could capture these giants. Today we are seeing more and more underwater footage from video enthusiasts and, more recently, drone footage. In this video, you can see the whales happily blowing through their blowholes as they surface and gracefully reenter the water. A nearby boat tracks the whales, dwarfed by their size. Humpback whales measure between 40 and 60 feet. That's the about the length of three cars! Strikingly little is known about these masters of the sea. Though we originally thought that they lived and traveled in stable pod families, even this is refuted today. Recent studies have found that, aside from calves and their mothers, the whales tend to leave and join various group formations as individuals. Each group is relatively unstable. What we do know for sure is that these whales are intelligent mammals who sing beautiful songs in choruses beneath the waves.